Cheboygan State Park is a popular Cheboygan area campground located only 17.5 miles from the facilities of Mackinaw Mill Creek Camping in Mackinaw City, MI. Situated on Little Billy Elliot Creek and Duncan Bay, Cheboygan State Park is open year-round. Cheboygan State Park offers 80 campsites on 1250 acres. Camping styles vary widely and many State Parks may not be a good fit for some campers. Cheboygan State Park varies in their accommodations, features and facilities compared to Mackinaw Mill Creek Camping, so we have gathered information on Cheboygan State Park and contrasted them with Mackinaw Mill Creek Camping. 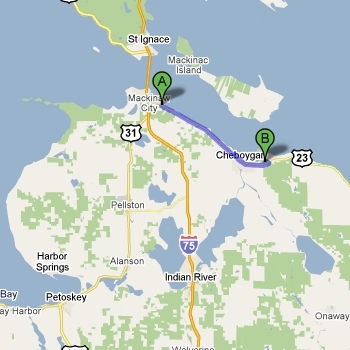 The chart below compares Cheboygan State Park versus Mackinaw Mill Creek Camping. Dozens of site types Cheboygan State Park offers 78 campsites & 2 tee pee sites. 200 Full Hookup Sites 1 site with 30 amp, none with 50 amp service. Variety of Lakefront Cabin Rentals Tee pee rentals available. We stayed at your campground last summer -- some of us in campers and some of us in your BEAUTIFUL cabins. I was able to tour several cabins our cousins stayed in, and was completely impressed with the workmanship, cleanliness, design and layout. I told my husband, "If we could buy one of those cabins, I would like to buy some land in Michigan, and sell our camper." Being a person who loves to wander all over Michigan, he was taken aback by my pledge. Many friends and family members turn to me when evaluating places to visit in Michigan, and I ALWAYS recommend your cabins and campground. We've stayed in a variety of places across our great state, and yours ranks at the top! Best wishes for a terrific camping season this summer - we'll be there!